had a meet-up with my SIM DE tutorial mates, after 1yr and 3mths. 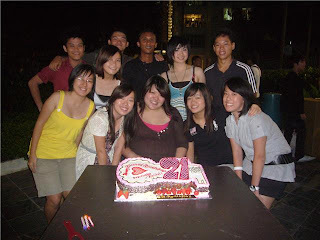 haha we had a meet-up in 2007 too, but it seemed like it was more fun this time round. haha almost everybody came after the arranged meeting time, and some of them said they couldn't recognise me at first when they saw me. lol anyway we went to fish&co at glass house for dinner. i love that place alot, with the nice atmosphere, music and stuff. we also took many pics in there. after that, we went to chill at plaza singapura starbucks. i've been thinking about this and was wondering if should say it. for the first time, i've decided to do so. normally, how to say? i wouldn't 'dare' to get the words out of my mouth?? i'm not sure why too, i guess it's because i know this group of friends are busy and even if i say it, it probably won't happen. so i didn't do so to prevent myself from getting disappointed. actually, i'm hoping to have a small reunion dinner with clarence, regina, grace and yisheng together. not sure if it'll really take place since i've said it. well, no harm trying my luck though. cya all soon. what we could have been, 11:38 PM. today, had steamboat with my coursemates at bugis after school. we went to chongqing huoquo. there were supposed to be more people joining us but ended up just 5 of us, danile, bertram, patty, miko and me. we moved around bugis street while waiting for time to pass. we can't help but to keep looking at the time as we were getting hungry. at 4+pm, we finally walked over to the steamboat shop. what we could have been, 11:39 PM. some of them were discussing about their 21st celebrations next year, and the thought of turning 22 this year came to my mind again. there's a saying, when you pass 21 years old, the years will flow past very quickly. i'm beginning to believe this statement. previously, we were talking about how to celebrate our 21st birthdays, now we talk about getting married. i guess it's always this case? before 21 years old, everybody wish to grow up quickly because they can get complete freedom then. yet now, i wish to go back to a few years ago. for a moment, i just hope that time will slow down itself. anyway come monday, i'll be meeting michelle and chiekling for dinner at chompchomp. tues, will be steamboat with my coursemates and i'll be having my diploma tutorial group gathering this friday. it's gonna be a fun week (i hope). lol and CNY is just 2weeks away!! what we could have been, 11:49 PM. Looking forward to an exciting year ahead!! what we could have been, 12:05 AM.